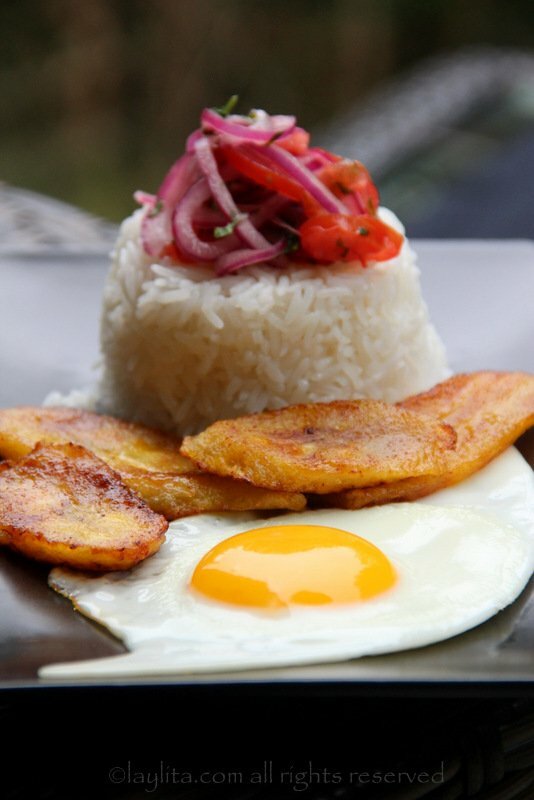 Arroz con huevo, or rice with fried egg, is the ultimate Latin style lazy lunch. This was my go to lunch as a high school student, especially if I was hanging out with friends and our moms weren’t around. Don’t let the “lazy” part confuse you, even now as an adult (who can somewhat cook) I still find this dish is so delicious and comforting. The only difference is that now I usually add some extra sides like fried ripe plantains, avocado slices and tomato onion curtido salsa for a perfect Latin comfort meal. 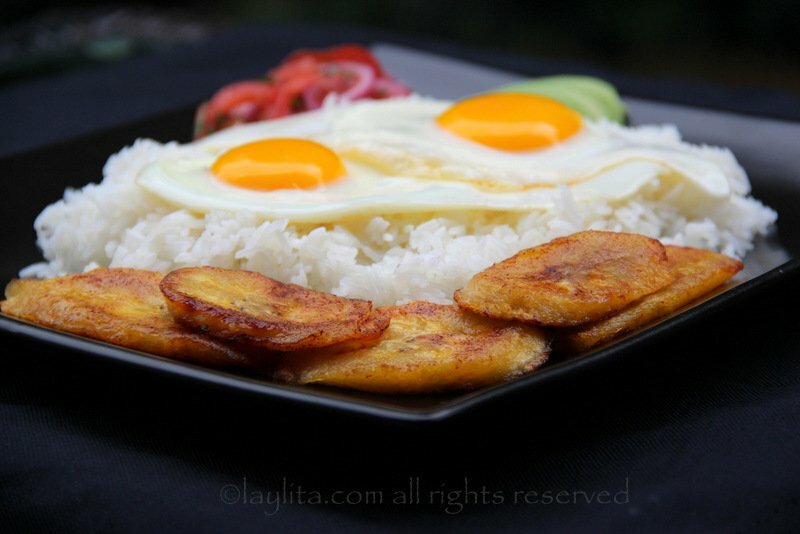 The combination of Latin style cooked rice, a bite of egg, ripe plantain and the curtido are so mouthwatering-ly good! 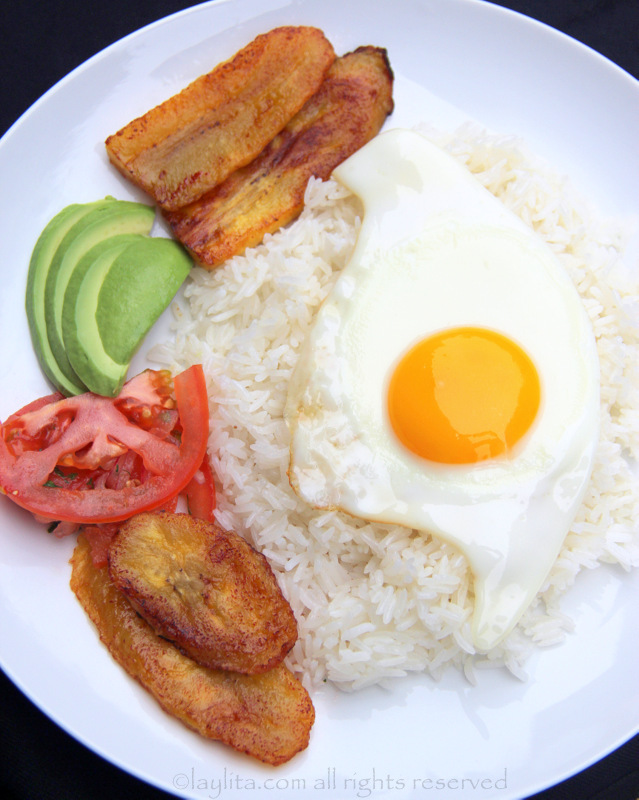 Arroz con huevo, or rice with fried egg, is the ultimate Latin lazy lunch. Add some extra sides like fried ripe plantains, avocado slices and tomato onion curtido salsa for a perfect Latin comfort meal. Heat the oil to medium, add the eggs and cook to desired doneness. 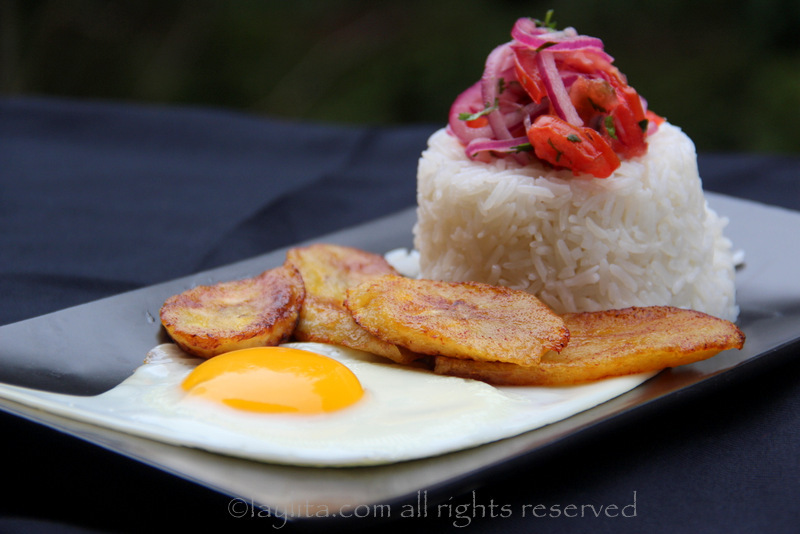 Serve the fried egg(s) with rice and ripe plantains. Can also add avocado slices, tomato slices or tomato onion curtido salsa. I used to make fun of my husband, Nicolas, because while in college his “specialty” dish was pastas and ketchup (yes, this is a French guy going to college in Lyon, a city known for its culinary greatness) and his German roommate used to tease him about his “high French cuisine”. 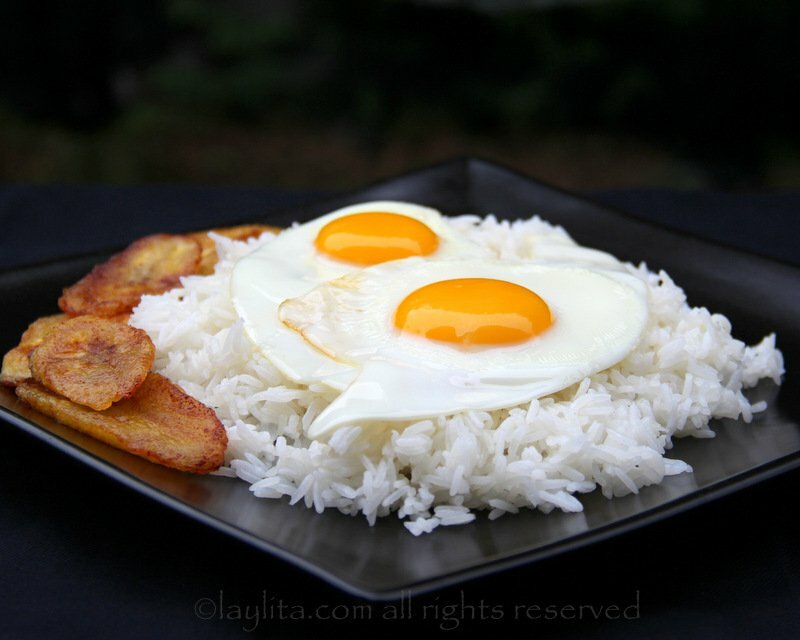 Well, I this arroz con huevo or rice with fried eggs is my equivalent of “high South American cuisine”. 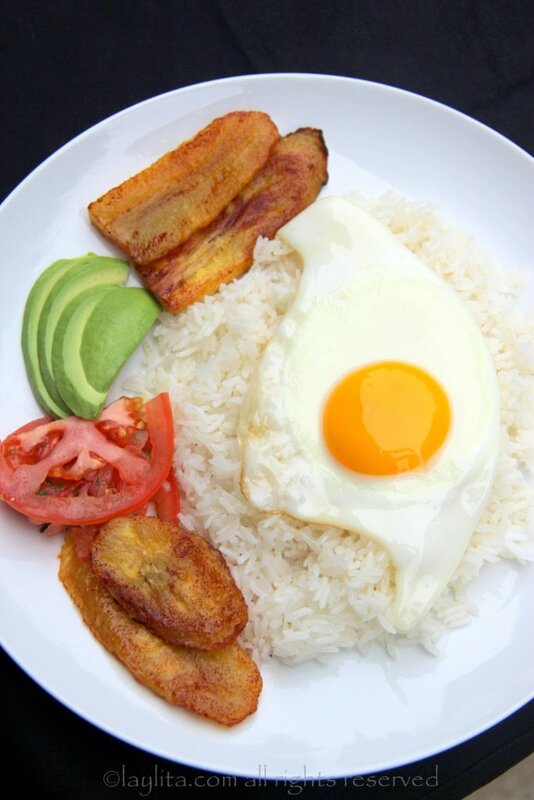 Arroz con huevo is the classic lazy person’s meal in South America; this is our ramen noodle equivalent. Students, especially those who don’t want to or don’t know how to cook, are known to live on this dish, I knew quite a few guys who could only cook rice with egg. Some of the best after school lunches in high school (our school days were over at 1pm) took place with my friend Ines and her specialty was rice with egg (she has added a lot more dishes to her current repertoire). She loved to add ketchup to hers which I still don’t understand, of course it turns out that my kids like it that way also. So even though arroz con huevo is not the most sophisticated dish, I have great memories of the times I ate it and I make it on those days when I crave it or when I’m in a hurry. A final thing I’ve discovered as an adult: a glass of wine goes well with arroz con huevo. 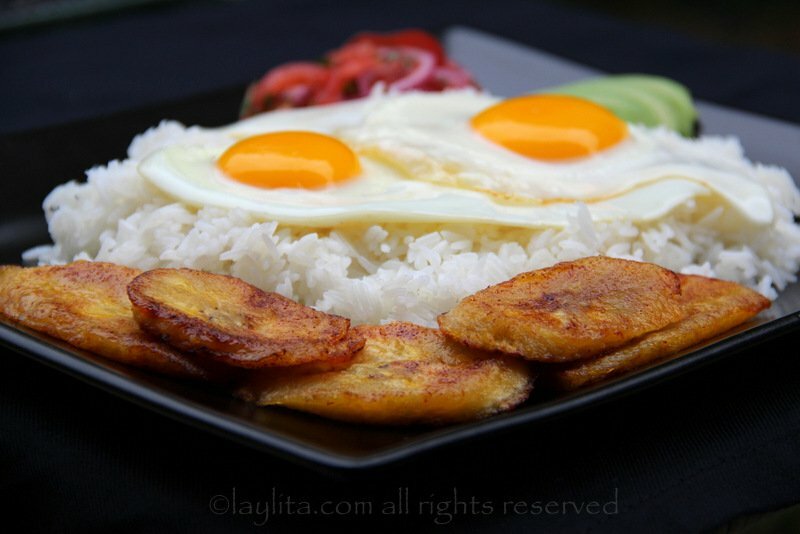 In my opinion, if you are latin than you will always love arroz con huevos fritos y plantanos maduros! This is my favorite favorite breakfast ever. To me, this is the ultimate comfort food! 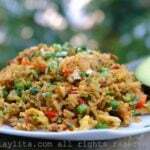 Especially when it is made with arroz amarillo. Do you know of any good Peruvian food blogs? I lived there for two years, but have had issues finding really wonderful recipes. Thanks! Hi Amy – I agree, this is comfort food! I’ve found a couple of Peruvian blogs that I like, one is http://donlucho.com/ (it’s in Spanish) and another is by an American living in Peru, it is canelaycomino.com (though it looks like it has been taken down but it had a lot of good Peruvian recipes). 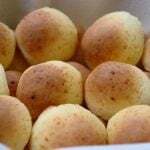 I’m from Bolivia and we make this with my mom all the time! We add diced tomatoes and onions w/parsley on top. Love your site! Wow… you have brought back “good old” memories. We used to eat this dish just like you have it shown once in a while when growing up. We used to add to the dish a whole banana…uuumm yummi. There is nothing better than the mixture of these tastes. By the way, I love your page and the pictures are awesome. Thanks for making it easy for me to follow some of my homeland dishes that I love so much.